My Writing Journeys is a "100-page writing-practice book that engages students through a wide variety of writing and art forms. Each activity has been designed to draw on the students’ personal experiences and connections." This colourful book is a great way to start the day in the classroom and makes it easy for teachers to find engaging activities. 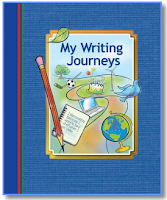 My Writing Journeys supports Ontario curriculum and provides daily writing practice. Page features include graphic organizers, writing tips, art tips and adjective pages. There is no planning required and online resources will be made available in August 2012. It also provides students with a keepsake to take home at the end of the year. Be sure to download free sample activities for the month of June. Each pdf file contains a writing page and an art page. My Writing Journeys is available for order at a cost of $7.96 per unit. All orders placed before June 29, 2012 will qualify for a 10% discount. I'm all for encouraging writing in children and the earlier, the better. This looks like a great resource for children, parents and teachers. Yes! And it was designed in part by a former colleague of mine who has been teaching for nearly 25 years. And you get to see how your child progresses from the beginning of the year until the end. As someone who has seen this product, this writing journal is rich in learning, and allows students to grow academically, emotionally, mentally and spiritually. The text allows students to use writing as a tool to express their feelings, while making connections to their lives and to the world around them. As a teacher, I believe that My Writing Journeys is a unique tool for educators as it not only covers the writing component of the curriculum, but rather it touches upon all subject areas, such as media literacy, science, social studies, etc. As a parent, this resource can provide your child with the opportunity to expand their intrapersonal thinking as it exercises their thought processing ability, allows them to reflect on their experiences, and it also allows them to appreciate that writing is an on-going and reflective process. All the activities are designed to engage or 'hook' the attention of the student, allows them to brainstorm their thoughts, encourages them to critically anaylze their writing process, as well as it shows them the development in their thinking and the growth in their writing. To make this Journal Book more affordable, we have reduced the amount of activities to 29. The book is now selling for $2.99 each.